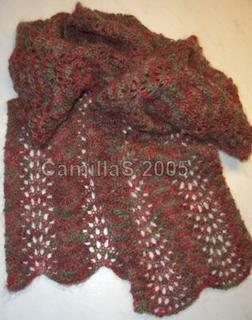 Scarf Style/Wrap Style Knit-Along: Here's my Misty Garden! Now my Misty Garden is finished. From 3 skeins of kid merino in the colour 'roses' i ended up with a 190 cm scarf. Another picture of my wearing it can be seen in this entry in my blog. I'm on my second one of these (love the pattern). I love your yarn choice. The colors are beautiful. Camilla, your Misty Garden is just lovely and very lady like...I adore it. WELL DONE! !